New Cape Henry Lighthouse is on the Virginia coast and marks the entrance to the Chesapeake Bay. Built in 1881, the structure replaces the original lighthouse deemed structurally unsound. 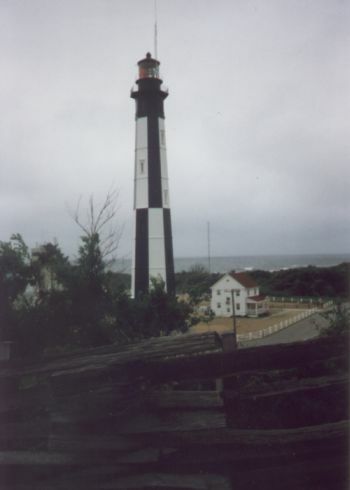 Cape Henry Light is octagonal in shape, stands 170 feet tall, and is painted with alternating black and white vertical lines. The lighthouse is of vital importance to the ships traveling to the ports along the Chesapeake Bay. Cape Henry Light is actually on a military base, Fort Story, and is very much a part of the Tidewater community. Growing up here, we often return home to visit family and friends. I always feel as though Cape Henry's beacon is guiding us back home as we cross the Chesapeake Bay Bridge and watch the beam of light as it flashes from Cape Henry Lighthouse.